Here at Low Budget Living we read The Times avidly so we were honoured when they contacted us in mid January 2009 to ask us for our top tips on how to beat the recession using your freezer. Of course we were all to pleased to oblige and our tips were duly published on 23 January 2009. The first thing that strikes us is that if you ask yourself what is actually in your freezer - would you know? Maybe a few orphaned fish fingers or some left over turkey from Christmas that will never be reused? As a nation we waste £10 billion worth of food every year! Many of us throw away perfectly good food from our freezer so we can fit in this week's shop. It's time for a food freezing revolution…. 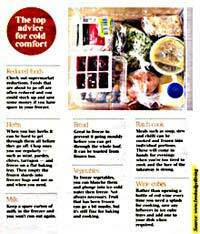 Here are our top tips in full (as seen in The Times) to help you make the most of your freezer! When you buy herbs it can be hard to get through them all before they go off. Chop them and freeze on a flat baking tray. Then empty the frozen shards into freezer bags and use as required. Rather than opening a bottle every time you need a splash for cooking, save any leftovers in ice cube trays and just pop one into your dish when required. Bread is great to freeze to prevent it going mouldy before you can get through the whole loaf. It can be toasted from frozen too. To freeze vegetables, blanche them and plunge into ice cold water then freeze. Fruit that has been frozen can go a bit mushy but it's still fine for baking and cooking. Batch cook meals such as soup, stew and chili and freeze individual portions. These will come in handy for evenings when you're too tired to cook and the lure of the takeaway is strong. Keep a spare bottle of milk in the freezer and you won't run out again. So next time you have something left over that's freezable then why not give it a go. And of course keep on checking what's in that freezer. There's no point in freezing it if you don't use it!